For some musicians, it is written in the stars. But, there’s always some learning to be done, too. 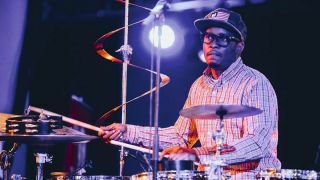 Growing up playing drums in church, Dave attended Houston, Texas’ famous High School for the Performing and Visual Arts, the same school attended by contemporary jazz stars Robert Glasper, Walter Smith III, Jason Moran and Eric Harland. Dave then went on to the Jazz Studies programme at Howard University, where his tutors included Geri Allen and Grady Tate, but his playing caught the attention of producers Jimmy Jam and Terry Lewis and, faced with the choice of finishing his studies or touring with R&B band Mint Condition, Dave hit the road. Now he’s one of the industry’s most sought-after players. His distinctive beats can be heard on Justin Bieber’s Purpose, D’Angelo’s Black Messiah, the Grammy-winning Black Radio by the Robert Glasper Experiment and Adele’s record-breaking 21. When he’s not busy as a session musician and sideman, he leads Chris Dave And The Drumhedz, featuring a rotating cast with himself at the core. "Players include bassist Pino Palladino, guitarist Isaiah Sharkey and Cleo Sample on keys, all playing an unpredictable blend of jazz, hip-hop and whatever takes their fancy. We spoke to Dave to learn more about his rise to drumming stardom. How did you meet Jimmy Jam and Terry Lewis? “This was prior to YouTube and the internet being stupid crazy. There was an album floating around that I played on, Kim Burrell, which was my first professional gospel recording - that album did a lot in the whole gospel field and there were a lot of jazz things on the album. The things I was criticised for were you can’t have jazz interludes on a gospel album, or you can’t have the odd-times we put on the album. "So, by the time I got to Howard, that was already known and then I was hanging with Greg Hutchinson and Clarence Penn and they would come into town because they were playing with Betty Carter or Roy Hargroves. We were all friends, I was just the one in school and everyone else was working with famous artists. I was trying to finish school, that was the goal, that’s when the Mint Condition stuff happened in my sophomore year. "I was like, ‘Yeah sure,’ because in my mind they’re not ever going to hear us play anyway. Then they were like, ‘We want to come check out some musicians,’ because this was when Jimmy and Terry were starting their Perspective label. This is right after all the Human League stuff, all these hits they had, Janet Jackson. “They came to the practice room, we were playing, Jimmy and Terry were like, ‘Hey, we need to get your number.’ I gave them the number of the girl I was staying with. After that I went back home for the summer, they were calling me and I didn’t know. What did Mint Condition want from a drummer? “At that point, they just wanted a drummer for Mint Condition because Stoke [Stokely Williams] was such a good drummer himself, but he was the lead singer, so he was hard on all the drummers they had. "Their first drummer was Michael Bland who played on all the Prince stuff and Prince took him from Mint, so they had no drummers in the interim and I just happened to meet them at that point. That’s how I was introduced to Stoke and everyone and then we all jammed. Did you want to be a full-time band member? Who would you say has most shaped your approach as a bandleader? “I would say Mint Condition, because I met so many people from Prince, Kenny Garrett and Meshell Ndegeocello, through Mint Condition. We might be on tour with the Isley Brothers, who are heroes to my brothers, so I’m sitting there watching and learning and talking to them, that was the real college for me. When recording with stars such as Justin Bieber and Adele, do you work with the artists directly or mainly with the producer? “Both at the same time. We have fun in the studio, so with Adele we probably ate and kicked it a few times that day, and then Rick [Rubin, producer] shows up, we crack a few jokes and then we start listening to what we’re trying to accomplish for that day. "Adele sings live, so everything is all live takes, it’s not like we’re laying the music today and then they come in two weeks later and we never meet. Especially when I work with Rick, the artist is there, most of the time - they’re actually singing with us while we’re playing even if it’s a scratch track or a demo. Do you plan what equipment you’ll need for each session? Does that apply to your live performances? You often have multiple snare drums on stage. Do you use triggers now? With the Drumhedz album, did you approach Blue Note or did they come to you? “Don Was [label president] was instrumental with that going to Blue Note. He knew I had a lot of stuff in the vault, but I was trying to figure out a proper way to channel the music where it could not be disturbed and be heard in its entirety. He came to a couple of Drumhedz shows a few years back and we started to talk. It’s kind of weird, because we didn’t have any albums out, but we still had shows and we were selling out especially in Europe, Japan, China and Russia and all these other places. They’re like, ‘Why are you in Australia and you don’t have a record out?’ And we were trying to figure that out! “That helped us out leverage-wise. Don was like, ‘I think what y’all are doing and me being president is very hand-in-hand with what I’m trying to do and the movement y’all are trying to create.’ He understood we were coming from the side of all the musicians and writers and artists - some may get monetary value but everybody just wants credits and for people to know what they do, what they contribute to anything, especially if it’s great. We represent a small portion of that. Everyone on the album, from the mixing down, is a Drumhed and family. Drumhedz is outside of just the people on the album. Do you see yourself as part of a wider movement with other similar genre-blending artists such Robert Glasper? “No, I think this is a departure. When we were doing the Robert Glasper Experiment, that’s more me, Rob, Derrick and Casey sitting around playing. With Black Radio, we didn’t even know what we were going to play until we literally walked in the studio. ‘Oh, let’s play this, let’s play this, we should call Lalah [Hathaway], see if she’s in town.’ That sparked a lot of things, but that’s just normally how we play individually. 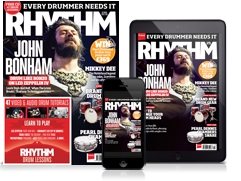 “This is more like the new movement of showing drummers as leaders with no ego or pride. It’s about the music, and the music is messages, sonic sounds and things of that nature. The drums are really mixed well and different than say anything Blue Note ever had. Drumhedz is not another Robert Glasper album. It’s not ‘this sounds like Adele or this sounds like a Justin Bieber song’. “This is Drumhedz, so that’s why the album takes place in outer space because we’re not even on the Earth when we’re doing the album. The album starts with you going through a portal, just so you know you’re getting away from all of the other stuff. This is real musicians, artists, blah blah blah, coming together so once you get into the portal, now you’re in the Drumhedz world and the album is like a playlist of all of us together. That would be the playlist of you in the Drumhedz world, introducing people like Bilal and Tweet, they’re real special to us.